No need for introductions, Erlend Øye and (and who's that other guy? I kid!) Eirik Glambek Bøe (yeah like you knew that...) are back with the soothing sounds of Kings of Convenience. The indie-pop-folk-rock-duo have a new album out at the end of the month. It follows their time proven-soft spoken-beautiful style. 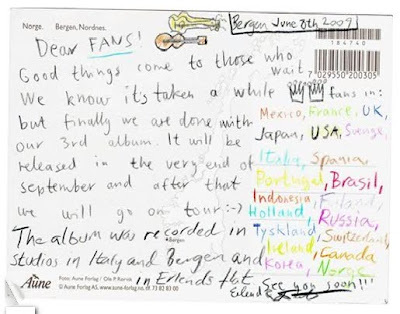 And judging from the postcard (I got it at their site) it seems like a tour is in the works as well. Here is the video for the 2nd single from the album of the same name, Boat Behind. One thing to note... what's up with all the indie "vintage" videos? It's like everybody got the "70's film style" plug-in and decided to use it at once. Either way, wherever/whenever they are in the video, it is a lot better than where I am (work...on break I swear!). one of my all time favorite vocalists!! so smoooooth....erlend oye fo-eva! Love kings of convenience. Excited for the new album, already heard the other single Mrs. Cold on KCRW, so good. Great video too, how come I've never come across hitchhikers like that?